The phone continues to be the platform technology used in this digital age of health care, according to Better Together: High Tech and High Touch, a survey report sponsored by the Bipartisan Policy Center and the Council of Accountable Physician Practices. Nielsen’s Strategy Health Perspectives project polled 5,014 U.S. adults in June and July 2015 for this study. According to the study sponsors, this is the largest consumer population studied conducted to-date on the topic of digital health use and demand. The first chart illustrates the reality of digital health in the U.S. 2015: that notwithstanding the availability of telehealth, remote health monitoring, mobile health apps, and smartphones, even simple phone-based communications in health care are scant. Just one-half of consumers receive phone call reminders from their primary care providers. Just over one-quarter of U.S. adults say they have access to log on and see their information on a patient portal. This number has doubled (increasing 13 percentage points) from 2014, from 15% to 28% in 2015. Some 20% of consumers receive email reminders for appointments, 15% emails about their health, 15% are offered communication via secure online messaging, and 9% texted appointment reminders. Although the use of digital tech in health remains relatively low among consumers, there is interest in accessing personal health information, as well as services, in ways that are convenient and streamlined for everyday life. 52% of U.S. adults look forward to the day when they can access all of the information pertaining to their health in the same place. At the same time, the proportion of consumers concerned for the privacy and security of that information is falling, from 58% of consumers concerned that who’s accessing that data in 2014, down to 41% concerned in 2015. Consumers’ experiences with electronic health records has been largely positive: 77% of consumers agreed that all physicians treating me should have access to information in my EMR, and 61% believe that the EMR allows their doctor to pull valuable information about their past health. Still, even with most physicians adopting EMRs, and an increase in consumers’ availability to patient portals, there is unmet need for transactions such as online appointment scheduling, secure online messaging, and actual use of those portals. Physicians themselves aren’t too keen on technology solutions for consumers: 11% offer email reminders, 8% text reminders, and only 5% recommend that patients use a mobile app to track physical activity levels. 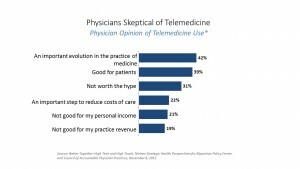 Physicians are also skeptical about telemedicine, and don’t regularly use the platform. The second chart shows that in 2015, 19% do patient diagnosis over the phone, and 9% of physicians conduct remote monitoring of vital signs as well as interactions with patients using audio and video equipment. Health Populi’s Hot Points: There’s a wide chasm between consumers wishing 24×7 access to advice, information and health care, vis-à-vis physicians’ skepticism about the technologies that enable those services. I talked about this in September 2014, covering WebMD’s and Medscape’s consumer and physician surveys in Crossing the digital health chasm between consumers and providers. Here’s a good example of that expectation gap: 89% of patients believe they have a right to see all the notes taken by physicians during a visit, compared with 64% of doctors. We know the value of shared decision-making between patients and providers bolsters health engagement and activation, and ultimate health outcomes. Yet doctors and patients aren’t on the same page on this when it comes to Open Notes (my take on the 2012 Open Notes study published in the Journal of the Annals of Internal Medicine). The encouraging part of this is that Dr. Pearl’s peers at the Council of Accountable Physician Practices’ 28 multispecialty groups, who have adopted digital health tech like telehealth, secure email messaging with patients, and predictive analytics, have pioneered population health and shared decision-making with patients. Their NCQA ratings published in October 2015 have found the CAP members to rank in the high echelon of programs, Dr. Pearl said. “We are prepared to lead,” he asserted.